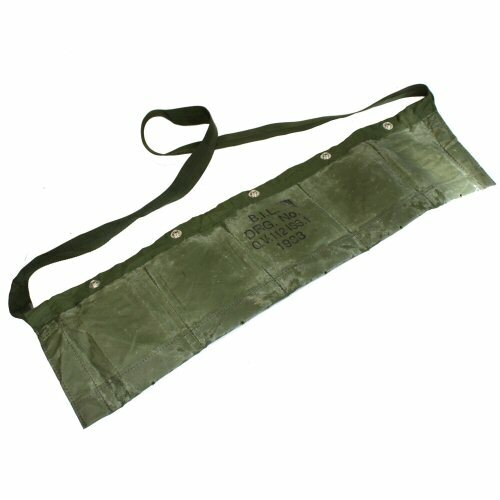 Olive British Army issue nylon bandolier with five pockets secured with press studs. The bandolier has a nylon strap for quick grab and carry, and each pocket is closed with a popper. The nylon is coated to waterproof the outside and the bottom of each pocket has a small drainage hole. The waterproofing has worn in some places. Each pocket was originally large enough for 30 rounds of 5.56 ammunition on 10 round clips, but is also large enough for a variety of other combinations, such as 15 rounds of 7.92 ammunition on 5 round clips.